8 am - 5 pm, Monday through Friday. Meetings by appointment only. 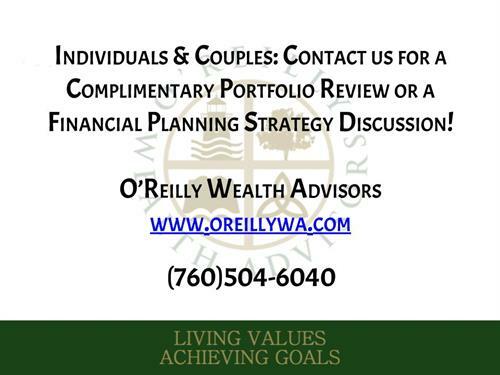 Independent Registered Investment Advisory (RIA) firm serving as Retirement Plan Consultant to 401(k), 403(b) and other retirement plans and as investment advisor/financial planner to individuals and couples. 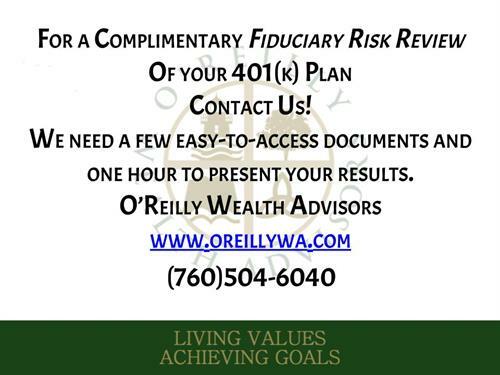 Read more about us at our North San Diego Business Chamber listing and our website, www.oreillywa.com. Call us at 760-504-6040. Why is a fiduciary important? Meetings by appointment only. Contact us for directions.